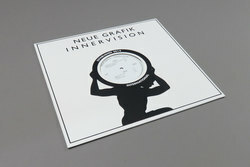 Neue Grafik - Innervision. Vinyl EP. Bleep. Following up a few impressive releases for 22a and Slime, Parisian producer Neue Grafik cements a long-time friendship with Bradley Zero by debuting on Zero’s Rhythm Section imprint (Mallard, FYI Chris). Innervision maintains the MPC-boogie aesthetic of NG’s excellent Soul Conspiracy EP while also turning its attention more towards the dancefloor. ‘Dance To Yemanja’, ‘To Peckham Rye’ and ‘Why You’ are all chunky deep house jams of the Motor City Drum Ensemble school, the kind of cuts which have been the cornerstone of Rhythm Section’s success. The EP is bookended by two lights-low neo-soul numbers that wouldn’t sound out of place on a D’Angelo record.